While there are many types of municipal bonds such as GO bonds and revenue bonds, these bonds are generally issued as either current interest bonds or capital appreciation bonds. As an example, if a $100,000 principal maturity with a 5% interest rate comes due 10 years from now, the investor will receive $2,500 every 6 months with their principal and interest due as the final payment. A common misconception is that current interest bonds pay both regular interest and regular principal. This is not true. 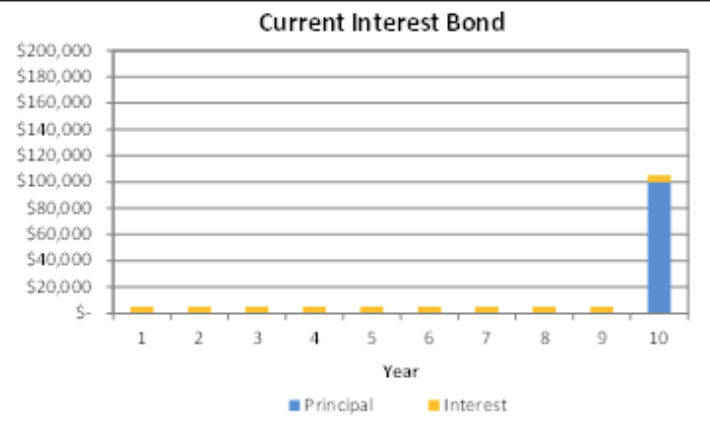 Current interest bonds are typically utilized with there is capacity to pay the regular interest payments.